Call us biased, but we believe a perfectly seared steak is the ultimate. And what better accompaniment than a big, bold tannic red. Right? Not necessarily. You see, a steak’s cut, doneness and the sauces you serve with it can change the way it pairs with your beverage of choice. To achieve true greatness, what you drink with your steak is just as important as the quality of the meat and how beautifully it’s cooked. But fear not. We’re here to help you discover the ins and outs of matching your steak with your wine for the ultimate, yes ultimate, dining experience. 1/ Fat softens tannins and high alcohol levels. So a steak with generous marbling will make big reds taste smooth and mellow. 2/ Leaner steaks like fillet pair better with lighter, less tannic wines. 3/ If your steak is super charred, think about wines with more ripeness and/or sweetness to balance out the slight bitterness. Characteristics: Tender, lean, delicate flavour. Match: Look for a restrained red. Something that’s not going to overwhelm the understated flavour of the fillet. Skip the big, heavy reds and go for something more subtle, like a Pinot Noir, Merlot or aged Cabernet Sauvignon. Characteristics: Ample marbling, intense flavour, succulent, high fat mouth feel. Match: Try a full-bodied, unashamedly intense red. A wine’s tannins won’t seem so powerful when they’re mixing with marbling. A dense, meaty shiraz will sing with your rib eye. Characteristics: A balance of tenderness with marbling. Match: You’ll need a wine with a good balance of acidity and complexity. Try a Cabernet Sauvignon, Cabernet Merlot or a GSM (Grenache, Shiraz,?Mourvdre). The tannins and relatively high alcohol will help cut through the marbling. Characteristics: The best of both worlds – half tender fillet, half sirloin. Match: Even though there’s some fillet in the T-bone, you’re still going to need a full-bodied wine to pair with this bad boy. You cant go wrong with a Shiraz or a young Cabernet Sauvignon. Characteristics: High marbling, high fat mouth feel. Match: Try a Nebbiolo. The tannins in the Nebbiolo will be attracted to the high fat content for a perfect crescendo! A rare steak will lessen the tannins in a wine. A young Cabernet Sauvignon or Pinot Noir paired with a rare steak will actually taste more mellow. A young Cabernet Sauvignon or a Grenache will work well with a medium rare steak. A well done steak loses fat through the lengthy cooking process. That means there’ll be less fat to counterbalance the tannins in a wine. Try a fruity wine that will help bring moisture back and boost the flavour. Consider a Merlot, Gamay or Beaujolais. 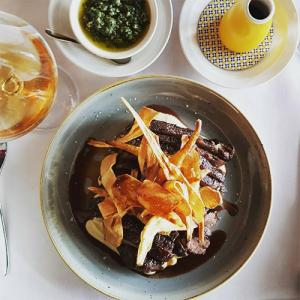 Image: Our Rangers Valley wagyu rump with parsnips three ways. Dish by @ottoristorante, pic courtesy of @primecutmeatsqld on Instagram. Delicious! This is a difficult one. Try an earthy, light-bodied Pinot Noir that’s still fruit driven, Cabernet Sauvignon or Sangiovese. This creamy white sauce would balance nicely with an equally full-bodied, creamy Chardonnay. If you can’t get your head around drinking white wine with your steak, then a Pinot Noir is also a great match here. A Malbec always does well with Chimichurri as it has a great balance of fruit and smooth tannins. Horseradish needs a wine that has loads of intense fruit. Again, a Malbec would work nicely or a Syrah. The earthy flavours in a Pinot Noir will pair perfectly with a mushroom sauce. Go for something complimentary to, not competing with the heat in the peppercorns, like an aged Cabernet Sauvignon. Any full bodied red will work well here. Think Shiraz and Cabernet Sauvignon. Well there’s our two cents worth when it comes to matching your wine with your steak. But at the end of the day, it’s all about experimenting and finding what you like and what works for you. That simply means you’ll need to eat more steak and drink more wine until you discover your pairing Nirvana. It’s a tough job, but somebody’s got to do it. Enjoy!